Peggy Browning, author of The Big 5-0 (Mattie Mason Mystery Series), is also a blogger. 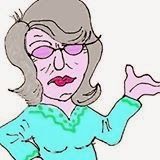 Her blog, Fifty Odd - Viewing Life After 50 Through Rose-Colored Bifocals is awesome and I've been a fan of her blog for some time now. 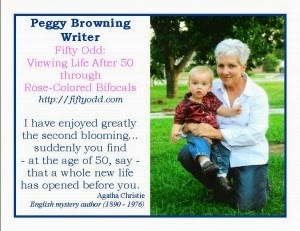 She does a feature on her blog of women writers over the age of 50. I'm actually going to be featured on November 10th and am very excited about that. 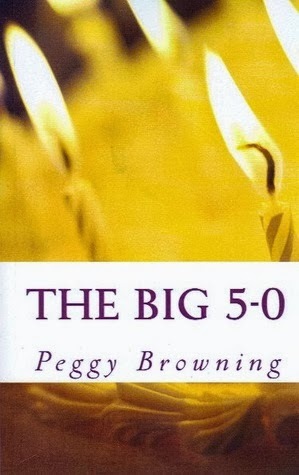 I recently picked up The Big 5-0 eager to read about a heroine who is actually about my age - something you don't find too often in fiction. First, this is a cozy mystery. A lovely, gentle mystery for the most part. Almost too cozy for me at first, and I nearly gave up on it in spite of the humor and great characters that Peggy had developed. When I got about 75% of the way through though, I really connected with Mattie and had to finish. I'm not sure why it took me so long. I think I'm just really cynical or something. Peggy does have one quirk in her writing that I found quite distracting. She writes her dialogue in a way I've never seen done before. She will have one character speaking followed by the words "she said" so you think that character has finished speaking, yet when you move to the next paragraph of dialogue it is still the same character speaking. That took some real getting used to for me. However, like I said before, I was finally hooked and my rating for this book went up significantly because of the last quarter of it and I loved the book in the end. It is also getting fantastic reviews by other readers. The moral of this book review is, don't give up too soon. You never know what is coming next. Have you read any books that you nearly gave up on but were glad you didn't? Which ones? Matilda Mason has been a good wife, an excellent mother, an obedient daughter, and a darn good garden reporter for the Cambridge Daily News. She's given all of herself to others...making sure everyone was well-taken-care-of whether they like it or not. She's baked birthday cakes, decorated her home, ironed her husband's shirts, and turned her newspaper stories in on deadline (most of the time.) Now she wonders if that's enough...and she finds, with some regret, that maybe it isn't, really, quite enough. Since childhood, Mattie wanted to be an investigative reporter, but then LIFE happened, and she never pursued her real love, her true desire, her longed-for dream. "...Hmmm, what can I say about myself? “The fact was that this birthday was making me feel needy and nervous. Suddenly I was on a deadline to accomplish something in my life. I looked at what I had done so far…raising a daughter, helping my mother and father in their business, being a good wife and a pretty good garden reporter…and saw that those things were OK. Much more than OK…even excellent. But that wasn’t all I wanted to accomplish. Those things were only a part of me and the most important part of me had been held back and needed to emerge. Now I had a shelf life. And it had a short sell-by date. Like Matilda, I’ve done lots of things in my life and had many roles that I’ve tried to fulfill to the best of my ability. Sometimes I succeeded and sometimes I failed. I’ve had lots of jobs, lots of experiences, and lots of laughter. I’ve had heartbreaks, too. And I have an opinion about all of it...."
Want to know more about Peggy? You can check out Peggy's blog or pop in and take a peek at her Facebook page.